Season the chicken pieces with salt and freshly ground black pepper and put them into a bowl. Add the bay leaves and rosemary sprigs and the crushed clove of garlic and cover with the wine. Leave to marinate for at least an hour, but preferably overnight in the fridge. Preheat your oven to 180ºC/350ºF/gas 4. Drain the chicken, reserving the marinade, and pat dry with kitchen paper. Dust the chicken pieces with flour and shake off any excess. Heat an ovenproof pan, add a splash of olive oil, fry the chicken pieces until browned lightly all over and put to one side. Place the pan back on the heat and add the sliced garlic. 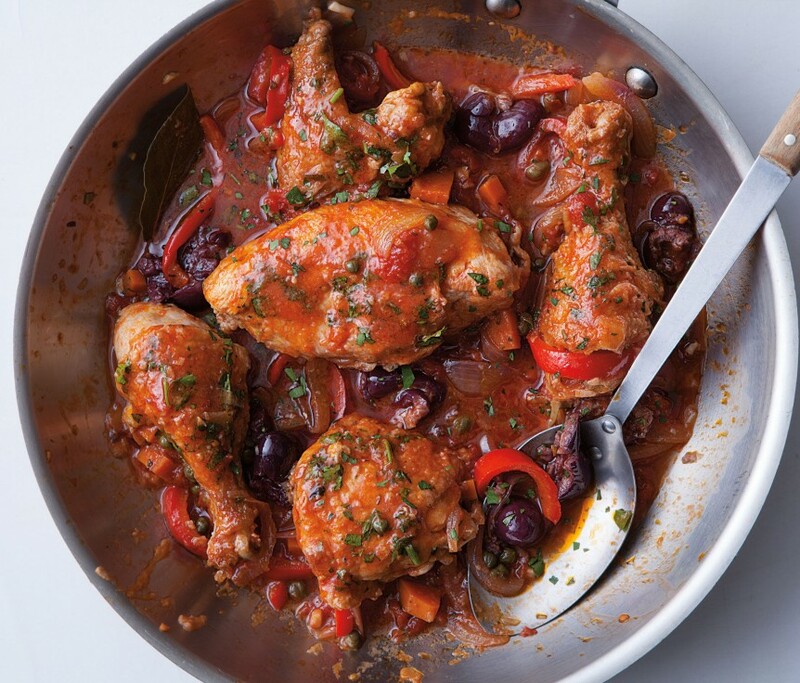 Fry gently until golden brown, then add the anchovies, olives, tomatoes (broken up with a wooden spoon) and the chicken pieces with their reserved marinade. Bring to the boil, cover with a lid or a double thickness layer of foil and bake in the preheated oven for 1½ hours. Skim off any oil that’s collected on top of the sauce, then stir, taste and add a little salt and pepper if necessary. Remove the bay leaves and rosemary sprigs, and serve with a salad, or some cannellini beans, and plenty of Chianti.